For all the twists and turns the Little Rock athletic department has undergone throughout the last three decades, there has been one constant. Van Compton, head volleyball coach. The Sun Belt Conference’s all-time winningest skipper, Compton has coached volleyball at Little Rock since 1988. She has guided her teams to five NCAA tournaments, hosted countless youth skills camps and has become an integral part of the athletic fabric at UA Little Rock. This year, Compton earned her 500th career win with the Trojans when her team swept Jackson State on Aug. 25. Before becoming a Trojan in 1986, Compton graduated with a degree in physical education from Arkansas State University and spent 11 years at Arkansas College (now Lyon College) in Batesville as a coach and instructor. While at Arkansas College, Compton coached women’s basketball and volleyball in a very different situation than the one in which she works today. Compton’s work with Arkansas College’s smaller athletic department soon gained the attention of UA Little Rock, who offered her a position as women’s basketball coach for the 1986 season. Compton said Arkansas College would often play home-and-home series with the Trojans, putting her on former LR athletic director Mike Newell’s radar. The year prior, Newell had led the Trojans men’s basketball team to a 23-11 regular-season record and its first-ever NCAA Tournament appearance. Newell’s team parlayed that success into a major upset, knocking off No. 3 seed Notre Dame 90-83 in the first round. 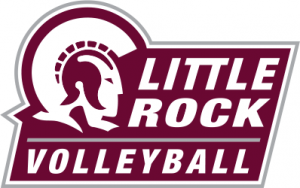 “UALR was kind of a unique situation,” Compton said, because while the men’s basketball team was a Division I member of the TAAC (Trans-America Athletic Conference), the women’s squad was in limbo, not quite transitioned. Compton added it was a difficult life as an independent program from a lesser-known school. Compton’s team, she said, ended up playing a number of local schools and had to travel extensively. Between the departmental disarray, poor facilities — the team played in the old fieldhouse — and financial troubles, her stint as women’s basketball coach was cut short after just two seasons. According to a Sept. 1988 Forum report, former UA Little Rock chancellor James Young announced the athletic program would no longer be funded by the university’s general account. Instead, it would be funded by private donations. In order to meet a budget crunch, Newell and colleagues chose to cut a pricier sport, women’s basketball, in favor of a less expensive volleyball program. Budget concerns had cut volleyball the year before, and the program had to be rebuilt from the ground up. Newell knew the right woman for the job. Compton began her career as Little Rock’s volleyball coach that fall, embarking on a journey that has lasted through three decades and counting. She has overseen the program’s rise from the NAIA to the highest level of competition, NCAA Division I. Her teams have gone from the fieldhouse to the 5,600-seat Jack Stephens Center. The Trojans joined the Sun Belt Conference (SBC) in 1991, and since then Compton has notched 233 career league wins and five SBC tournament titles. Her teams won three straight championships from 1996-98, and again in 2000, with the team’s most recent title victory in 2014. That season, Compton led the Trojans to their first-ever NCAA Tournament victory, a win over the University of Kansas in five sets. Off the court, Compton helps coach 200-250 young players a year with the Little Rock Juniors program. “I feel like we’ve helped make volleyball grow here in this area by offering that program,” Compton said. Compton said the most rewarding part of her job is fostering relationships with her players that last long after their eligibility is exhausted.